Despite what he tells Carson Daly, we now have photo proof that Big Ben has a lady friend by the name of Missy Peregrym. From an emailer, via bigbennews.com, here are photos of Ben from the Dan Marino Celebrity Golf Tournament with Ms. Peregrym. Check out their site for the full gallery. 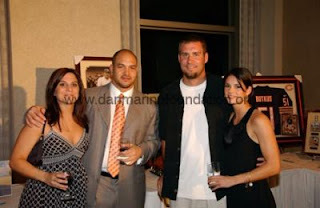 And yes, that's James Farrior. i think that was the first time i looked at the personal website of a "celebrity" that has pop up ads every time you click a link. maybe ben can loan her some money. seriously... who dresses that guy. That looks like the same girl he was photographed with last year at the White House dinner...but it's not his girlfriend, huh? Seriously, how does a random "actress" meet up with Ben?